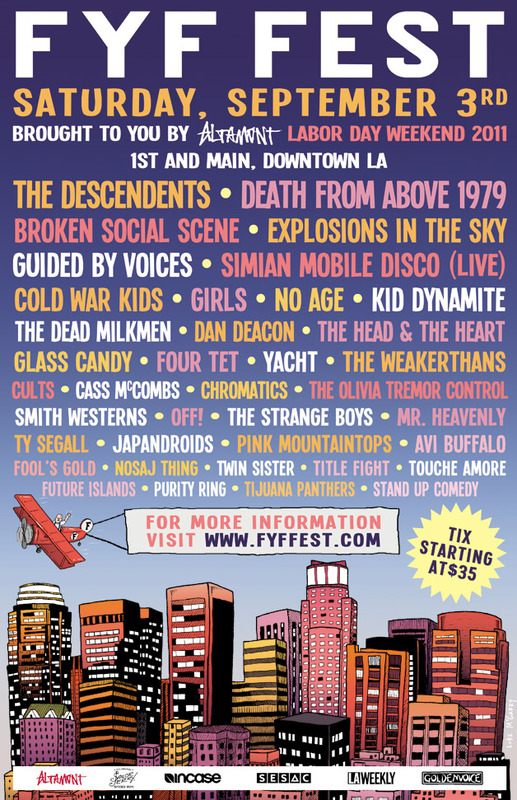 Apparently in an attempt to out do the east coast who has The Fest and Best Friends Day coming up soon, FYF Fest 2011 has been announced for September 3rd in Los Angeles. The line up for this festival is going to be pretty out of hand because it includes; the Descendents, Kid Dynamite, Explosions in the Sky, Broken Social Scene, The Dead Milkmen, No Age, The Weakerthans, OFF!, Title Fight, Touche Amore and lots more. Tickets go on sale June 17th for $35. Also, if you’re going to be in California for Labor Day Weekend and Downtown Los Angeles is not your thing, check outAwesome Fest 5. This entry was posted on Thursday, June 16th, 2011 at 3:33 pm	and tagged with Awesome Fest 5, Best Friends Day, Broken Social Scene, California, Descendents, Explosions in the Sky, FYF FEST, kid dynamite, Los Angeles, No Age, OFF!, San Diego, The Dead Milkmen, the fest, The Weakerthans, Title Fight, touche amore and posted in Music News, News. You can follow any responses to this entry through the RSS 2.0 feed.